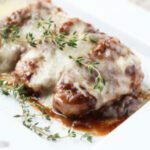 This French Onion Soup Roasted Pork Tenderloin recipe is sponsored by The Seeker Wines via One2One Network. All ideas and opinions stated are my own. Hi there, I hope you had a wonderful weekend! This morning was the 1st morning of the season that we woke up and the temperature was colder inside than what we had the thermostat set to. 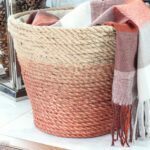 Of course we’re not talking about turning the heat on or anything yet, but it really made it feel like fall has arrived. This prompted me to get out the dutch oven and make one of our favorite meals, roasted pork tenderloin. With it feeling fall-ish out, it also got me in the mood for some french onion soup, a craving I always have when the weather starts to cool. Sooo I decided to combine the 2 for a nice comforting fall meal, along with another one of my favorite things, The Seeker Wines Pinot Noir, by making French Onion Soup Roasted Pork Tenderloin. With some special sauce! We really loved this meal. Like, really loved it; it’s the perfect fall comfort meal. 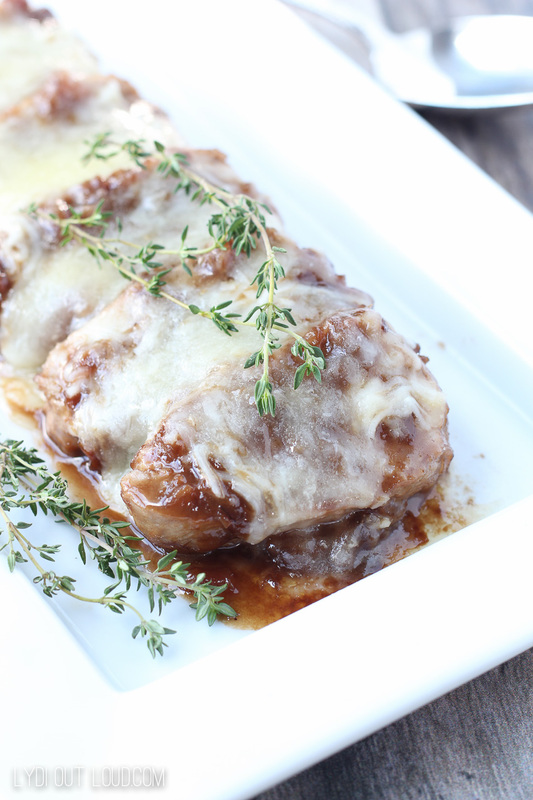 And let me tell you friends, it’s really all about the Pinot Noir French Onion sauce here. All about that sauce. But since we’re talking about French Onion Soup, you know I had to take it there with the cheese! I mean, have you met me?! #allthecheese. I used a blend of mozzarella and provolone; the creaminess of the mozz is a perfect complement to the bite of the provolone. Pat pork tenderloins dry and cut off silverskin; season with salt and pepper. Add olive oil to dutch oven and heat to medium-high. Sear tenderloins on all sides until brown, approximately 2 - 3 minutes per side. Remove from pan; set aside. Add french onion soup and wine to dutch oven; deglaze pan (that's where you scrape off the good crispy bits stuck on the bottom of the pan with your wooden spoon). Add pork tenderloins back into pan, along with 4 - 6 sprigs thyme. 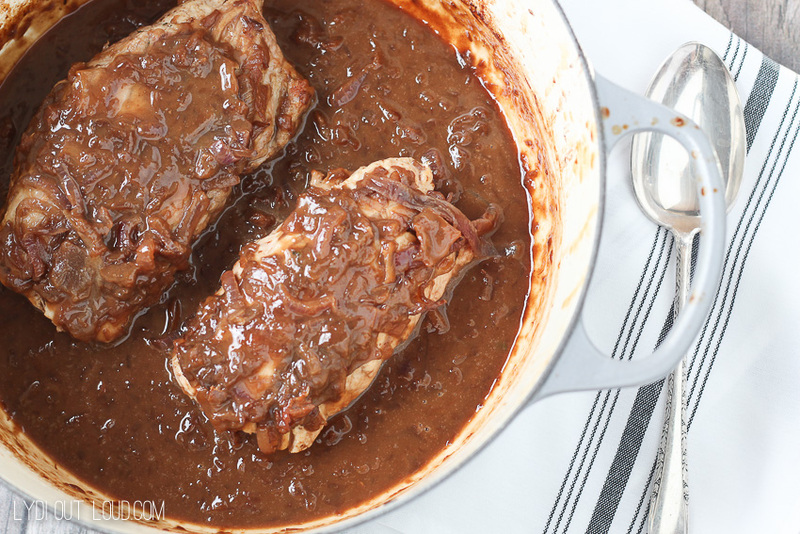 Cover with sauce and transfer to oven; roast for 12 - 15 minutes or until pork reaches an internal temperature of 150º. Remove tenderloins from pan, set aside and keep warm in a foil tent. Remove and dispose of thyme stems. Heat Pinot Noir French Onion sauce over medium-high heat on stovetop until reduced to a thick sauce. 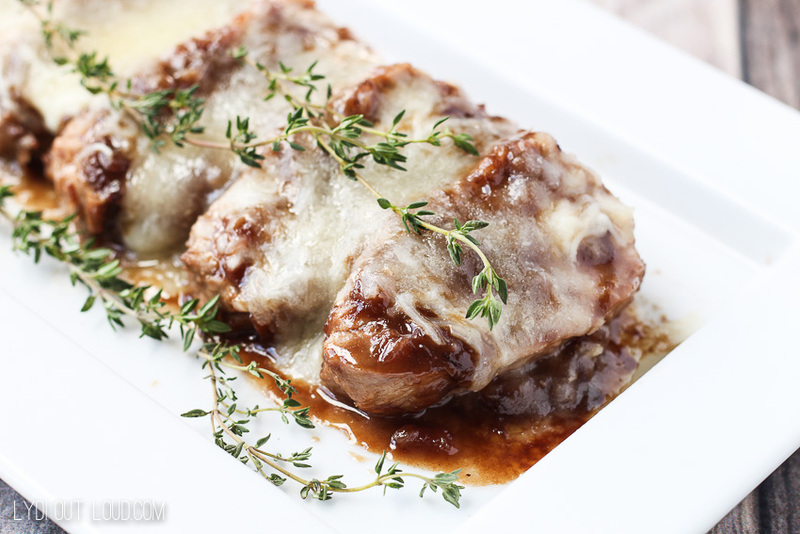 Cut tenderloins into 1 inch thick slices; top with Pinot Noir French Onion sauce. 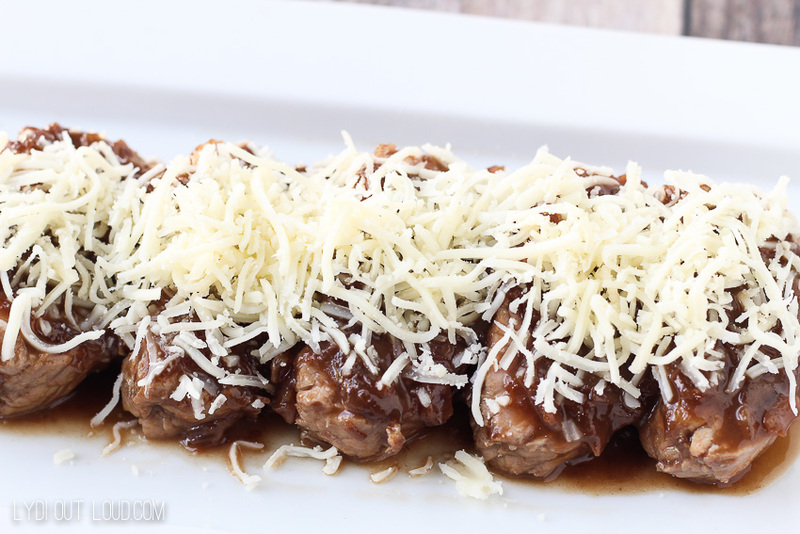 Sprinkle cheese blend on top of sliced pork and place under broiler for about 2 minutes or until cheese is melted. Optional: Garnish with thyme sprigs. 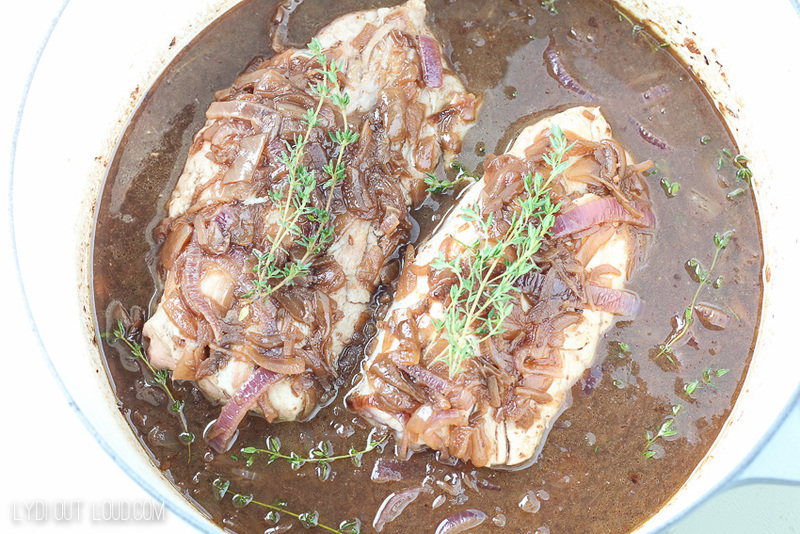 * In place of homemade french onion soup, you can substitute canned soup or 1 cup beef stock with 1 cup of caramelized onions. I use a combo of red and white onions for my soup. What do you think? 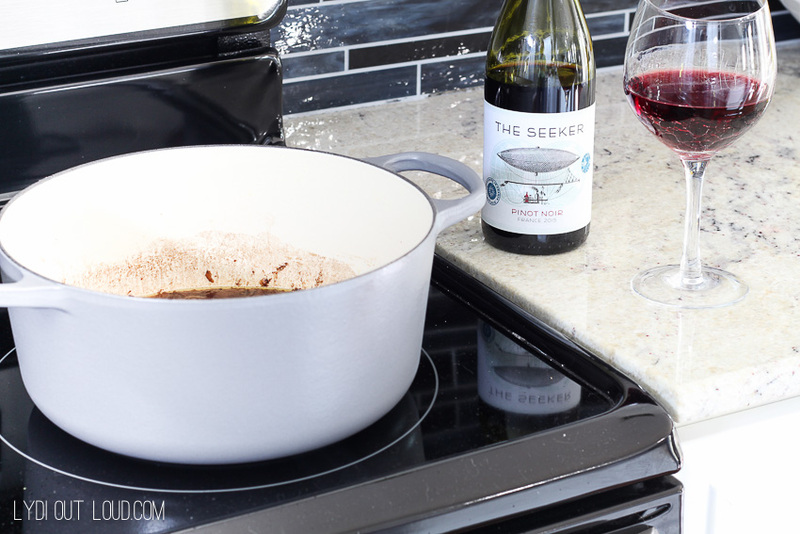 Are you ready to settle in for a nice fall comfort meal and a glass of The Seeker Pinot Noir? If you’re in the mood for a white, The Seeker’s Sauvingnon Blanc is my fav. And how fun are the bottles btw?! Flights of fancy! But in all seriousness, The Seeker is about a lot more than cool bottles and delicious wines (even though they win at both of those things); they are about global consciousness. 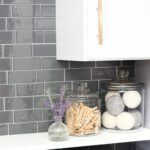 They use lightweight glass, recycled and recyclable, locally-sourced materials, and their winemakers are committed to sustainable practices in the vineyard and winery. I think it’s important to stand by and agree with the values of the brands we use and buy and I truly respect and admire what The Seeker stands for. See where you can find The Seeker Wines here. So what is your favorite fall comfort meal? 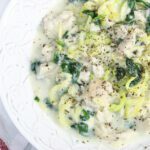 Do you enjoy cooking with wine? I have a favorite recipe for real onion soup that has red wine in it. That soup is beyond delicious. This recipe reminds me of that. Pinning it looks worth every minute of cooking it. Oh my!! This sounds SO good! Pinning and adding to my recipes list 🙂 Thanks for sharing with our Merry Monday party. 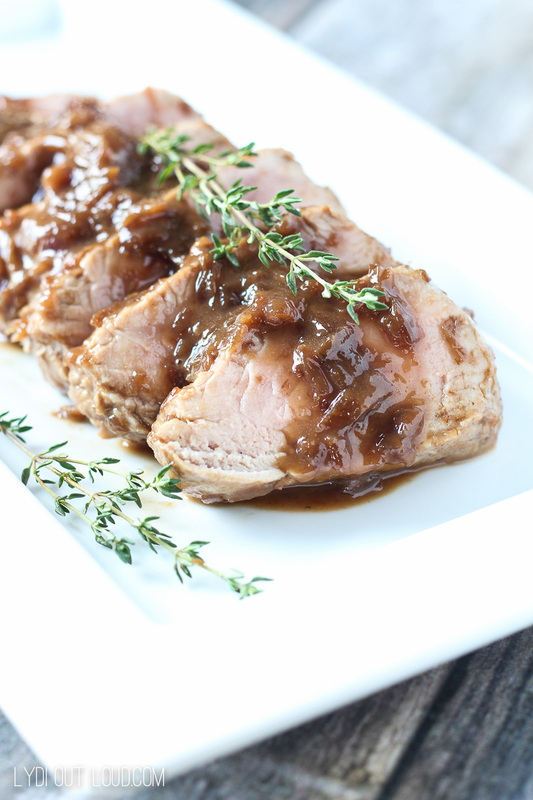 This recipe for pork tenderloin sounds perfect for this rainy weather that we are having. Love anything French Onion! Thanks Elaine! I’m with you. I heart French Onion forever! This would make such a lovely dinner party main entrée.